Have a big idea? Learn how you can bring it to life. After seven years of helping Makers launch their undiscovered products to the masses, The Grommet is sharing our community’s wisdom and insights to help inspire others. 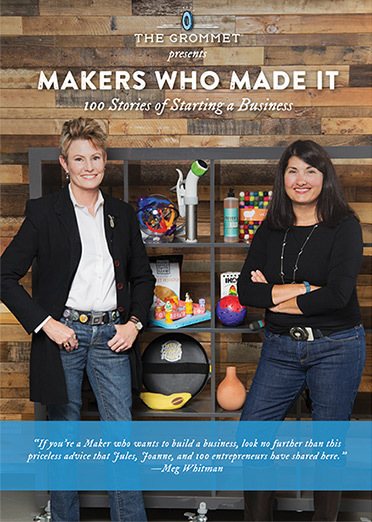 Makers Who Made It: 100 Stories of Starting a Business brings together The Grommet’s Co-founder & CEO Jules Pieri and Co-founder & Chief Discovery Officer Joanne Domeniconi, and interviews with 100 Makers, inventors, and entrepreneurs whose innovative consumer products have launched on The Grommet since 2008. It’s an honest, revealing collection of advice, reality checks, what to expect, and what you should (and shouldn’t) sweat when starting a small business. For Makers, inventors, entrepreneurs, and the ever-growing Maker Movement, this free ebook will help you understand how to develop an idea for a new consumer product, prototype it, manufacture it, launch it, promote it, and build a sustainable and thriving business. “If you’re a Maker who wants to build a business, look no further than the priceless advice that Jules, Joanne, and 100 entrepreneurs have shared here." Already a Maker? Makers Who Made It will answer dozens of your questions about growing your business—and helping you succeed. Featuring a foreword by Mark Hatch, TechShop CEO & Co-Founder and author of The Maker Movement Manifesto, and a preface by Julia Kemp, and profiles from 20 members of The Grommet team, the ebook is filled with tips to help Makers get ready to pitch their product to The Grommet. Since 2008, more than 60,000 products have been evaluated by The Grommet. Through its market analysis, testing, and evaluation processes, The Grommet has selected and launched only 2,000 products—or 3% of all products considered—helping Makers launch in a crowded marketplace and helping consumers find the most innovative products. Ready to develop your consumer product? Download Makers Who Made It for free to your ereader or as a pdf. Like to comment on the ebook? Want to launch your product with The Grommet?